Providing advanced comprehensive eye examinations and exceptional patient care begins with having the latest equipment. Our clinic uses state-of-the-art devices in the assessment and diagnosis of your eyesight, precisely measuring and analyzing your visual health and unique eye profile. As part of a standard eye examination, our patients receive a comprehensive battery of visual tests including digital keratometry, tonometry, fundus imaging, and digital refraction. When clinically warranted, upon referral, or at patient request, our doctors provide visual field evaluation and OCT scanning. Our team of optometrists and certified opticians are also available for contact lens consultation and fitting. With the latest devices in electronic imaging, our clinic brings accuracy and disarming simplicity to your vision assessment. 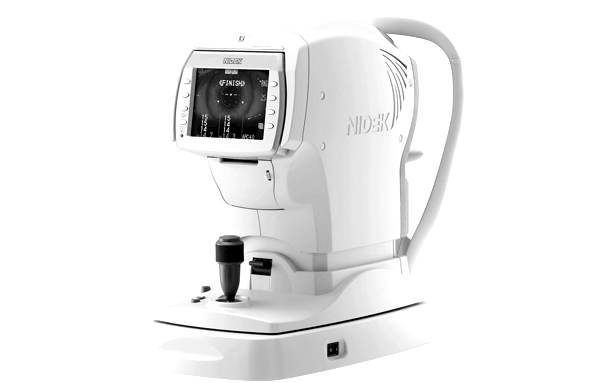 Essentially used to measure the curvature of the cornea, the keratometer produces a series of computer-generated measurements. These are used in tandem with the final prescription to select the most anatomically appropriate contact lens designs. Tonometry is a procedure used to gauge pressure levels within the eye. This important test evaluates a patient’s risk of developing glaucoma. At our clinic, this non-invasive test is conducted with the NIDEK NT530, which emits a softer and quieter air puff, resulting in increased patient comfort. The ZEISS VISUCAM captures high-resolution images used to conduct fundus testing. Fundus imaging records the back structures of the eye, including the retina, macula, fovea, and optic disc. Fundus testing can also be used to produce a series of stereo images, which aid in diagnosing, referencing, and monitoring various eye conditions. The VISUCAM’s autofluorescence feature facilitates the diagnosis of eye diseases such as diabetic retinopathy, glaucoma, and age-related macular degeneration (AMD). 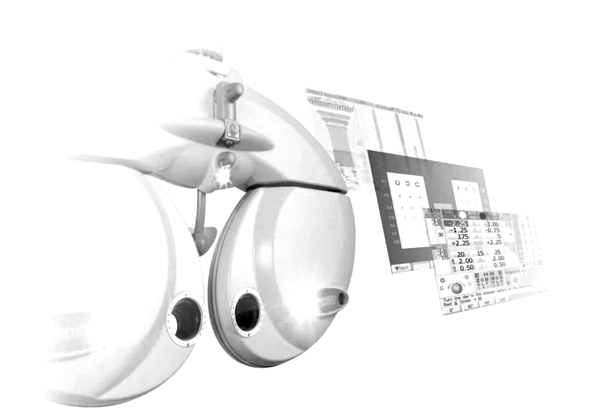 Outpacing traditional analog click-and-flip devices, the efficient lens disc rotations and ergonomic angles used in digital devices reduce ocular stress and patient confusion, while decreasing total refraction time. At the touch of a button, digital phoropters also facilitate patient comparison of even the slightest changes between old and new prescriptions. Visual field testing is used to assess the health and potential deterioration of a patient’s visual system. It is particularly useful in subjectively determining the loss of peripheral vision caused by glaucoma, stroke, central or peripheral retinal diseases, and other optic nerve disorders. Regular visual field tests are a critical part of an eye doctor’s monitoring and management of a patient’s glaucoma — serving as a baseline to how well a patient is seeing now, and how well they are likely to see in the future with their current treatment. Validated by more than 25 years of research, design, and clinical experience, the Humphrey® Field Analyzer (HFA™) is the accepted standard of care in glaucoma diagnosis and management. Our clinic is equipped with the most sophisticated OCT scanner that ZEISS has to offer — the Cirrus HD-OCT 5000 is the world’s leading OCT. A quantum leap in retinal imaging, OCT is a non-invasive medical imaging technique that captures a three-dimensional image of your eye and its layers at micrometer resolution. The instrument’s comparison of this image to established patient norms (e.g., within gender, age group) provides a straightforward method of assessing and monitoring the progression of diseases such as glaucoma, macular degeneration, and diabetes, among others. Dr. Teresa Stokes and Dr. Helen Nhan are accepting new patients.